Knitting in Art, Part I; Home and Abroad; and More Yarn to Give Away | Knit Like You Mean It. 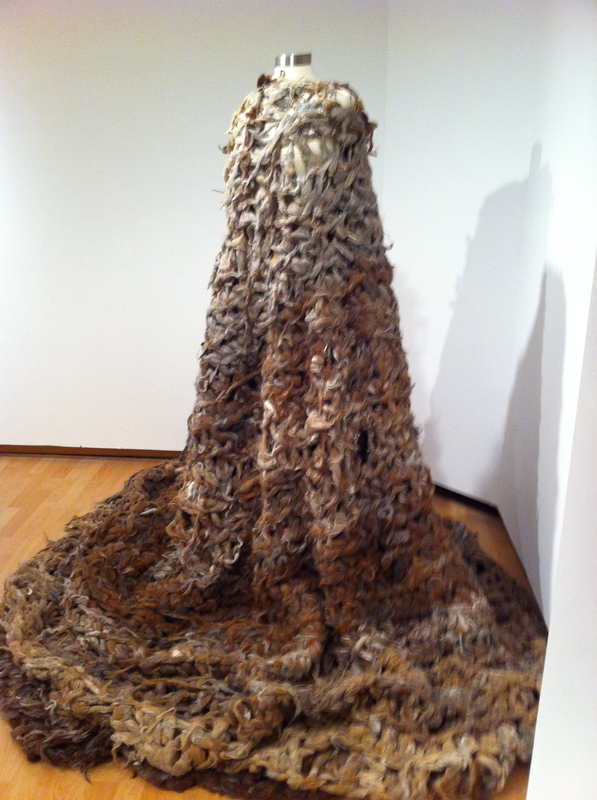 Nest, by Gabrielle Duggan, is made of alpaca fibers. See it at the Torpedo Factory through May. I feel like it’s ridiculous to keep putting “Yarn Giveaway” in the headline, and yet I want you guys to know that there’s yarn to be given away in this post, so…I’m torn. Anyone else have a preference? The winners of the three yarn opportunities last week were Becky, Carolyn, and Lynn (Carolyn, if you have a blog or Twitter account, let me know!). Funnily enough, I know each of these people personally. As always, I used the Random Number Generator to pick the winners from among the post’s commentors (leaving my own comments out). The next yarn giveaway will be explained at the end of this post. 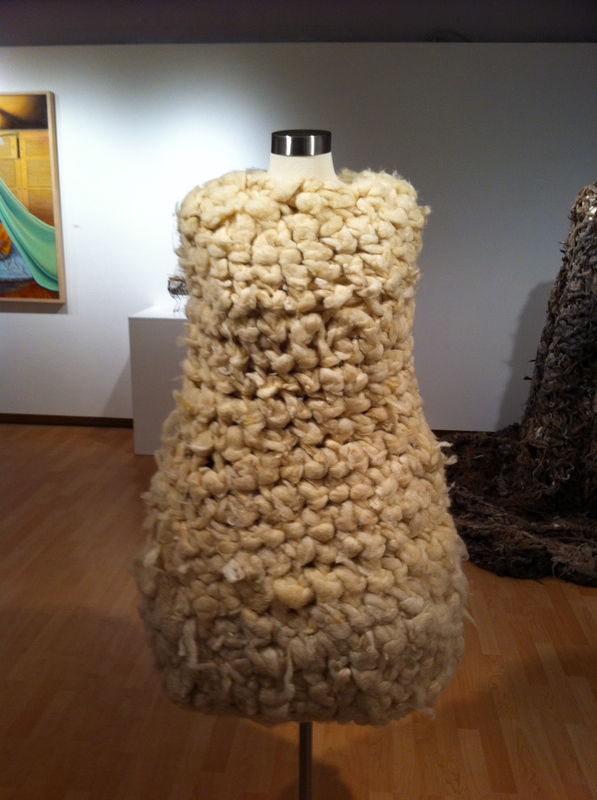 Scroll down if you must, but consider reading about some amazing woolen art first. Gabrielle Duggan's Wooleg is made of sheep's wool and is part of the Torpedo Factory's Nest exhibition. 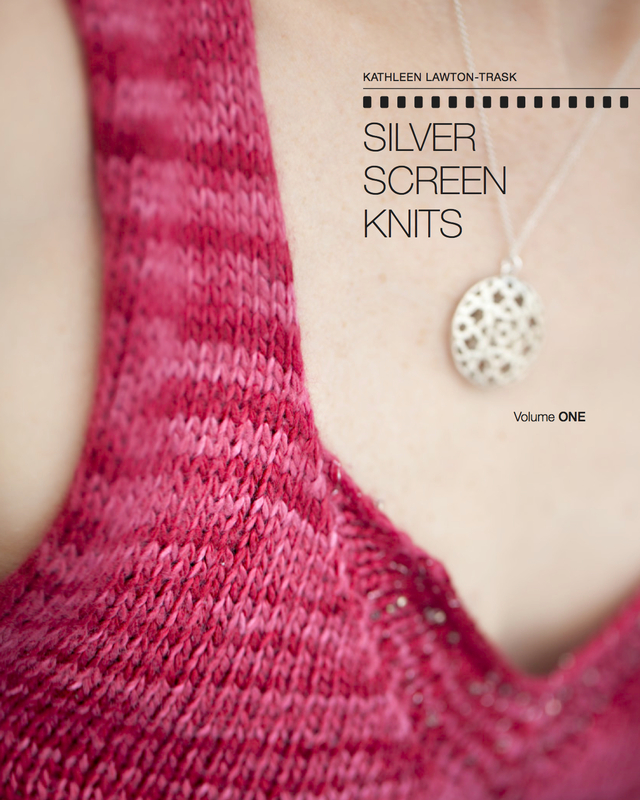 As knitters, we know more about the source of our clothing than most people. It’s not just wool; it’s alpaca, or cashmere, or merino. It’s that gorgeous blue we saw and knew we had to have, or the charcoal kettle dye that meant we had to alternate skeins. We know who made some of our clothing, because it was us – and we know how we did it, and how long it took. This is one of the aspects of knitting I really love – the way it slows us down, and helps us remember that everything is created by someone, somehow (even if they’re running a machine). It gives us the pleasure of creation, too – that’s something our modern society doesn’t have all the time. A friend and former colleague gave me a great tip long ago. GG of GG/SG starts out interviews for articles by asking, “So, where’s home for you?” As he explained it to me, this gets the person to open up, to talk about a place that’s important to them, and to reflect a little bit on where they came from. At the same time, it’s a fairly casual question, one you almost could hear at a cocktail party, so it sets the subject at ease. Sneaky, right? Particularly as Mr. Trask and I prepare to leave the DC area, this is an interesting question for me. I’ve lived on the East Coast for most of my life, and that looks pretty limited when I type it out. Home, though, as GG’s question highlights, is a flexible concept. For me, it’s what makes me feel safe, and loved, and known. This blog is home for me, and so is Mr. Trask, and so is (you knew this was coming) knitting. Writing is home to me, and reading, and tea, and a nice fire in whatever fireplace I’m close to. These things will be even more important to me next year, when we’re all the way across the ocean without most of our belongings. As we find new homes for the items we love, I’m reminded more of what’s really important: not the couch we bought when we first moved in together, but the person with whom I share the couch when we watch a movie. That kind of thing. 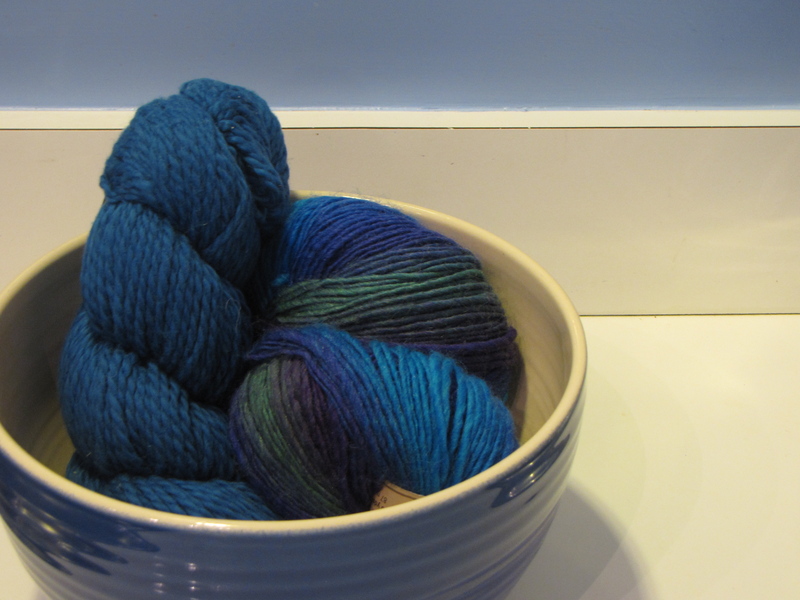 This week's yarn giveaway: Blue Sky Alpacas Dyed Cotton and Crystal Palace Mochi Plus. Comment for a chance to win! This brings me, in a roundabout, silly sort of way, to some of the belongings we’re letting go, namely…yarn. This week’s yarn giveaway has two parts. From left to right, we have a skein of lovely Blue Sky Alpacas Dyed Cotton in color 632, a beautiful blue, and two balls of Crystal Palace Mochi Plus in Neptune Rainbow. Both yarns are gorgeous – soft and shiny, with beautiful deep blue tones. Both have lived in our one-cat, smoke-free home in an airtight plastic box since I purchased them at fibre space. Comment on this post for a chance to win, and let me know if you contributed to the Cooperative Press Kickstarter campaign, too – a contribution of any amount will get you an extra entry in this drawing. I’ll select two comments at random from those made on this post between now and April 26 (Tuesday) at noon EST, and mail the yarn off to those people. Easy as pie! So, tell me – where’s home for you? Lovely post; made me sniffly. I know you must and want to go, but I hate the thought of it. It’ll take SO MUCH TIME for my cranky messages about editing to get to you!? i woiuld love a chance to win this yarn! the colors look just gorgeous! & no, I haven’t contributed to th Cooperative Press becasue i am (still!) unemployed & barely making ends meet, which explains why i continue to enter yarn give-aways with the hope i will win – no yarn buying for me this year! thanks for the opportunity to win! Exactly what Robin said. I’m in southern Illinois. Thanks for the opportunity to win that gorgeous yarn! What a wonderfully thought-provoking and heart-string tugging post! You will definitely be missed in the Alexandria area, but luckily there’s this blog and Facebook to help stay in touch. And, of course, I would love some free yarn too! It sounds corny, but I believe it’s true that Home is where the heart is. (Thanks Wizard of Oz!). Home is where I feel happy and safe. And of course loved and loving. Home is San Francisco, where I was born. By the time I was 19 I’d been shuffled to around to 9 apartments and 5 houses in three states. When I moved back to SF, I spent a couple months with friends then found the apartment I’ve been in for the last 35 years. Other than taking care of Mom in the North Bay Areay, the longest I’ve been away was two weeks on business in MN and one week on vacation in HI. I dread the day the landlady passes on and her kids kick me out! Your question is serendipitous in it’s timing for me, given I spent over six hours today driving “home” to spend the holiday weekend with family. The drive gave me ample time to think about the last week or two that have included some travel and also spending time with people I hold close to my heart. As I drew close to the town where I was born and spent roughly the first half of my life—noticing that which is familiar and also the differences that come with time—I couldn’t help but think about how, despite how comfortable I may feel in my hometown, I’m more at home—wherever I am—when I am with those I love and who love me back. As you say, it is in the person with whom [one] shares the couch when we watch a movie. Or Dr. Who, Masterpiece Theater, Mad Men… Whatever the locale or program, dear friend, there will always be a place for you on my sofa. Love your description of what “home” means to you. Thanks for the chance! Please enter me too if this is open internationally. Home for me is where I was born, my parent’s home. Home is wherever I feel comfortable. On my couch with the dog at my feet, walking in the woods. Having grown up in the ‘burbs of DC and in central NC, both places feel homey to me. I can’t wait for you and Andy to establish a new home in Oxford! A friend in college quipped “home is where your toothbrush is”. Sounded reasonable at the time. Now home is Alexandria, VA, which boggles my mind as I never meant to stay here for eleven years, but I’ve been here for eleven years, and how did eleven years sneak by a compulsive-geographic-cure seeker like me? I really enjoyed hearing about this exhibit and The Torpedo Factory. It reminds me of the Shelters exhibit by Kathryn Cobey there about 20 years ago. Wonderful knitted shawls draped over supports to form tepee shelters. Home can be so many things – wherever the heart is, I guess. H.ome is a safe cocoon. Home is Bangalore, India. Thanks for the giveaway.